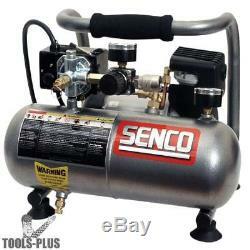 Senco PC1010 1 Gallon 1/2 HP Electric Mini Compressor. 1x Senco PC1010 1 Gallon 1/2 HP Electric Mini Compressor. There is a professional mini portable compressor that sweeps the competition. The Senco PC1010 Electric Mini Compressor, which utilizes a lightweight design (under 20 lbs) that any serious contractor can attest is an advantage at a jobsite where lugging a compressor up countless flights of stairs is the norm. Beyond the fact that the compressor weighs near to nothing compared to others on the market, it flaunts ultra quiet operation. It also has a 1/2 horse power oil free motor, one gallon air storage tank, 1.4 CFM air displacement, 90-120 PSI operating range, and a comfortable cushioned handle grip. The rubber suction feet act as a wonderful means of keeping the PC1010 in place and not marring the floor surface. Truly the Senco PC1010 is a complete steal with its fantastic price and ability to power small nail guns, such as the Porter-Cable PIN100 23 Gauge Pin Nailer wonderfully. Ultra quiet operation (by far, the quietest 1 we sell). 1/2 HP oil free motor. 1 gallon air capacity, 1.4 CFM air displacement. Pump up time: 128 seconds, recovery time: 48 seconds. Direct drive motor and pump for efficient operation. SCFM at 90 PSI: 0.7. Pump-up Time at 0 - 125 PSI (seconds): 128. Recovery Time at 90 - 125 PSI (seconds): 35. WARNING: California's Proposition 65. ALL products listed are under the authorization & permission of the manufacturers who make them. We do not break up combo kits to sell the component. BRAND NEW unless they are clearly marked as "reconditioned". Come in their original packaging (NIB). Tools Plus has been in business for 35+ years and we are dedicated to providing you the highest level of quality service. If you would like us to call you, please send your question along with your name, contact number and the best time to reach you. (Please note: feedback is left once received). An important note regarding Heavy or Bulky items. Destinations "might" necessitate the need for a Lift gate or other additional expenses. These additional expenses are extra cost and you will be contacted for your approval of these extra expenses. You can always ask questions in advance using the Ask a Question feature on this page. Your product's safety and Your Satisfaction is our priority! Images in our listing are indicative of the product and may vary slightly. Accessories are NOT included unless specified in the listing. We don't build anything. So please don't hold against us: color variations nor changes in the products country of origin. Tools Plus sells through numerous outlets, therefore, items may become unavailable unexpectedly. Tools Plus is committed to providing a great customer experience with an easy return process. When you put in a return request, Tools Plus will provide you with a Return Merchandise Authorization. The item "Senco PC1010 1 Gallon 1/2 HP Electric Mini Compressor New" is in sale since Tuesday, September 12, 2017. This item is in the category "Home & Garden\Tools & Workshop Equipment\Air Tools\Air Compressors". The seller is "tools-plus-outlet" and is located in Prospect, Connecticut. This item can be shipped to United States.